Ground-penetrating radar has already helped scientists discover liquid water under Mars' surface. It might also be the key to discovering if life exists on our cosmic neighbour. With NASA's Curiosity rover hogging the limelight, snapping selfies and beautiful panoramic images of the Red Planet, it's easy to forget the six active satellites orbiting Mars, quietly getting on with their job. 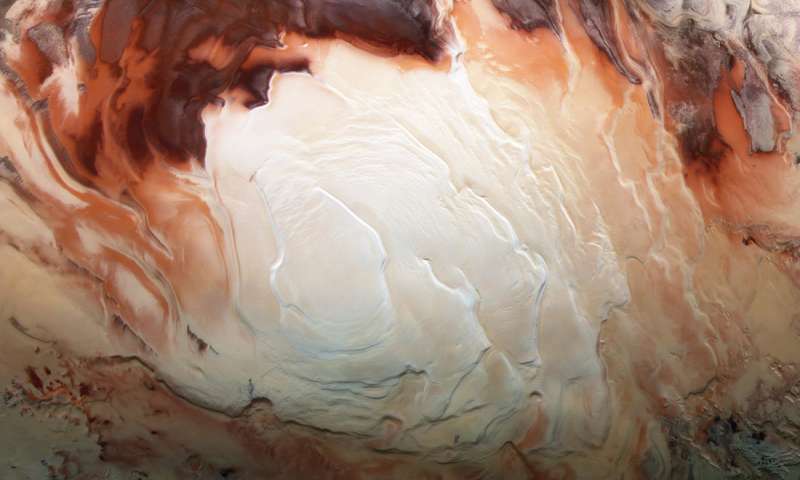 But one of these—the European Space Agency (ESA)'s Mars Express—hit the headlines recently when researchers discovered the most compelling evidence yet of liquid water on Mars. This water wasn't in a pond on the surface that researchers just happened to miss. 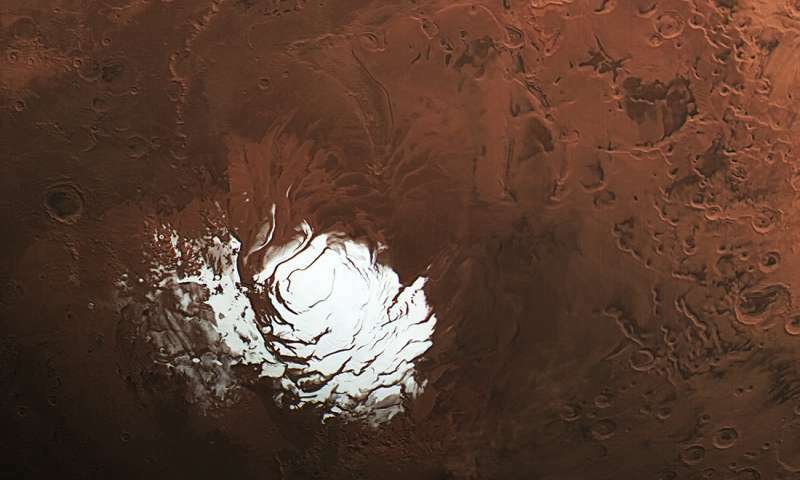 It was lurking 1.5km under Mars' south pole, forming a 20km long shallow lake. Led by Adjunct Professor Roberto Orosei of the National Institute of Astrophysics in Bologna, Italy, the ESA team found the lake by painstakingly analysing measurements from a radar instrument called MARSIS on board the satellite. MARSIS fires radio waves at the planet that penetrate the ground. These waves reflect back in different ways depending on whether they hit rock, ice or water. "Echoes are much stronger—sometimes stronger than echoes from the top of the ice—when liquid water lies beneath the ice sheet," Roberto reveals. The lake is deep underground and must be very salty to stop it from freezing, given it has frozen carbon dioxide above it, which freezes at -125°C. Nevertheless, some experts believe the discovery raises hope that life could persist there. Of course, if life doesn't exist in similar environments on Earth, then hopes will be dashed. Yet only months before, a pair of similarly salty subsurface lakes were found beneath Devon Ice Cap in the Canadian Arctic. Again, the discovery was made using ground-penetrating radar. If researchers dig down into these Arctic depths and discover a unique hidden microbial community—as they have in other subsurface lakes—the case for life existing in Mars' lake will be a whole lot stronger, though a mission digging 1.5km down to prove it would be fraught with difficulty. Back here on Earth, ground-penetrating radar is used in a host of industries. In civil engineering particularly, radar helps to survey our railways, roads, tunnels, bridges and complex underground utility networks. And it is also valuable in mineral exploration too. Radar helps to plan mines that take advantage of Australia's rich bauxite deposits—the world's main source of aluminium. It's also a useful tool in coal, zinc and nickel mining. But according to Dr. Jan Francke, founder of Groundradar and a researcher with nearly 30 years' experience in the field, radar will soon be able to do a whole lot more. He thinks new radar concepts being developed by Australian mining research organisation AMIRA International are only "12 to 18 months away". These technologies would bring a 5m antenna down to just 10cm. "If you couple that concept with new low-cost transmitters and receivers or satellite imaging technology such as hyperspectral cameras, we could mount them on a swarm of low-flying drones for scanning large areas in full 3-D."
This would provide high-res underground details to hunt for minerals deep underground much more efficiently. Could similar drone swarms be used to seek out more potentially life-harbouring underground lakes on Mars? NASA is funding an exploratory study on using bee-like drones to survey the Red Planet. If those drones were mounted with tiny ground-penetrating radars, we might find underground lakes much closer to the surface—lakes we could burrow down to more easily in order to finally learn whether life exists beneath the ice of our cosmic neighbour. This article first appeared on Particle, a science news website based at Scitech, Perth, Australia. Read the original article. Life exists on North Sentinel Island, and they don't want any intervention.